If you are not a fan of the newer methods of making fudge and are longing for the version cooked on the stove, then old fashioned fudge recipes are for you. This page contains old-fashioned chocolate fudge recipes. With my mother's help, this was the first candy that I ever made and it brings back more memories than I can count. We always made fudge for Christmas for the family as well as for neighbors and as gifts for many people. We could never make it on a rainy day though as it wouldn't set up properly, so on rainy days, we made cookies. There was a time when ladies took their well-behaved children and visited other mothers. They'd spend all afternoon making candies. Fudge, Divinity, and Sea Foam Candy. Much of it went into CARE packages for our men and women overseas, but we children could always look forward to having a few pieces in our Christmas stockings. Today, with such a bountiful array of every imaginable kind of candy so readily available at every drug and grocery store, we don't make homemade candy that much anymore. It's still the best candy in the world though, and every child should know the difference IMHO. Pookarina's Note:The syrup was not added when I was a child, but I learned in later years that it helped with over-crystallization of the sugar. It still remains an optional ingredient and is not absolutely necessary. The original recipe on the backside of Hershey's Cocoa cans did not mention anything about Karo syrup. Line an 8 or 9 inch square pan with aluminum foil, butter the foil. Mix sugar, cocoa, and salt in a 4 quart saucepan, add milk and corn syrup (if using). Cook over medium heat, stirring constantly until mixture comes to a full boil. Boil without stirring until mixture reaches 234 degrees F on a candy thermometer (soft ball stage). Remove from heat, add butter and vanilla; do not stir. Cool at room temperature to 110 degrees F.
Beat with a wooden spoon until fudge begins to thicken and loses its gloss. Spread quickly into pan, let cool to room temperature, then cut into squares. Pookarina's Note: We used a buttered heavy platter for fudge. If I were making it today, I'd still use a buttered platter. The butter aided in being able to cut and remove the pieces from the platter. Today, you only have to lift the foil along with the candy, place it on the counter top and allow it to cool thoroughly. Once in a while, we slipped up on the weather conditions, and our fudge wouldn't set up, so we ate it with spoons while watching one another like hawks to make sure no one got more than they were supposed to be getting. The boys were terrible little piggies. I have been using this fudge recipe since 1961. It is a creamy type fudge and very easy to make. Mix sugar, evaporated milk, marshmallows, butter, and salt in a saucepan. Cook stirring over medium heat until it comes to a full boil. Stir constantly and boil for 5 minutes. Remove from heat. Stir in chocolate morsels until melted. Add nuts and vanilla. Pour into buttered pan or Pyrex dish. Cool and cut into squares. It's chocolate fudge, yum! It brings back memories of my childhood. It's very fattening, but we all deserve a little indulgence sometimes. Mix the sugar, cocoa and milk in heavy large pan. Cook on medium high until the soft ball stage, then cook for one minute longer. Remove from heat and add vanilla and butter or margarine. Mix. Now, beat the mixture by hand. I use a wooden spoon. The beating may take awhile if it is humid outside. Keep beating until mixture thickens up and gets a glossy look. If you taste it during the beating, you will notice that it is very creamy at first, when it is about time to pour the mixture into a buttered pan or dish, you will notice the taste getting richer and a little gritty. When it gets to that stage, you need to pour quickly or it will set in your cooking pan. After pouring into dish, put in fridge and let set. Cut into squares. Enjoy, but you may need a glass of water or milk to go with it, this recipe is extremely rich. Source: My great-grandmother Nellie Brown. She made this every year for Christmas for the whole family. Every single person (from young children to adults) got their own batch of fudge, wrapped in colorful cellophane in a pretty Christmas dish; no wonder we aren't very thin! This fudge is not smooth and creamy (equals slimy to me), it is the old fashioned stuff that was made before marshmallow creme. It is absolutely delicious and the grainy texture is not from the sugar not dissolving, it's made to be this way! Combine sugar and evaporated milk together in heavy pan and boil for 8 minutes. Pour the above mixture over the chips, butter, marshmallow creme, vanilla and nuts and stir. Line an 8-inch square baking dish with foil and spray with non-stick spray. In saucepan melt butterscotch chips and stir in vanilla frosting. Stir in nutmeg and rum extract. I am looking for a recipe for easy old fashion fudge. I like Aldi's dark chocolate chips. If Hershey or Nestle dark are on sale and I have a coupon, they work also. Follow the directions carefully and no short cuts. 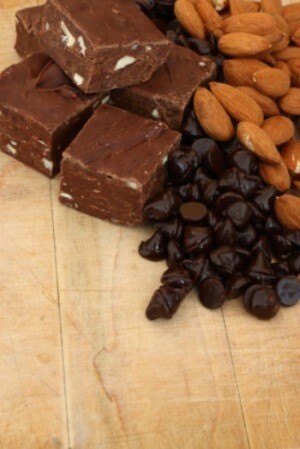 HERE IS A LINK TO OLD FASHIONED FUDGE RECIPES. Dad's fudge recipe since 1975. Everybody has their favorites but I really like easy to go with the taste. Here are some good tips for making great fudge and a very good recipe.